The Easter Rising of 1916, perhaps the most dramatic event of modern Irish history was over after just five days of fighting. The shadow cast by the insurrection however, however, lingers until the present. 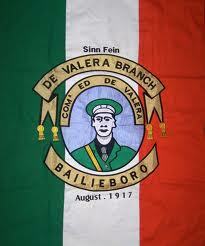 A flag from 1917 featuring Eamon de Valera, the last surviving commandant of 1916. The first question was when to commemorate the events of 1916. The Rising had broken out on April 24th and Pearse had surrendered on April 29th of that year. However the Rising had also been deliberately timed to coincide with the Christian festival of Easter, which of course changes dates every year, being tied to the lunar calendar. The first question for commemoration was whether to go for the date of the Rising -April 24th to 29th or Easter Sunday. And so, almost a year on from the Rising, on April 9th 1917, Dublin commemorated the insurrection with a riot. 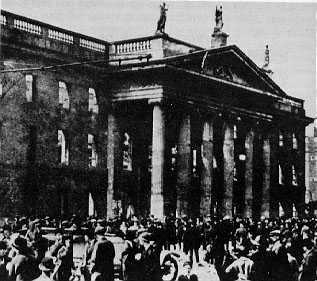 A republican tricolour was hoisted over the ruined GPO and another over Nelson’s pillar, the spiralling monument that overlooked it. ‘That was the signal’, the Irish Times reported, ‘for an outburst of cheering and various other demonstrations of approval on a wide scale’. When the police, after some effort sawed down the temporary flagpole, they were stoned by inner-city youths, who used as missiles the debris of the building work that was re-building O’Connell Street. The police had temporarily to retire from the north inner city as what the Irish Times sniffily called ‘young toughs’, looted shops, damaged a Methodist Church and overturned several trams. The first anniversary in 1917 was an opportunity for separatists to show their renewed defiance to Britain. The IRA parades in Dublin at Easter 1922. (picture courtesy of the Irish Volunteer website). The Republicans of 1917-21 saw the 1916 insurrection as being vindicated by the subsequent swing in public opinion behind the separatists of Sinn Fein in the election of 1918. The Irish Republic declared at the GPO could, retrospectively be seen having as been democratically endorsed. 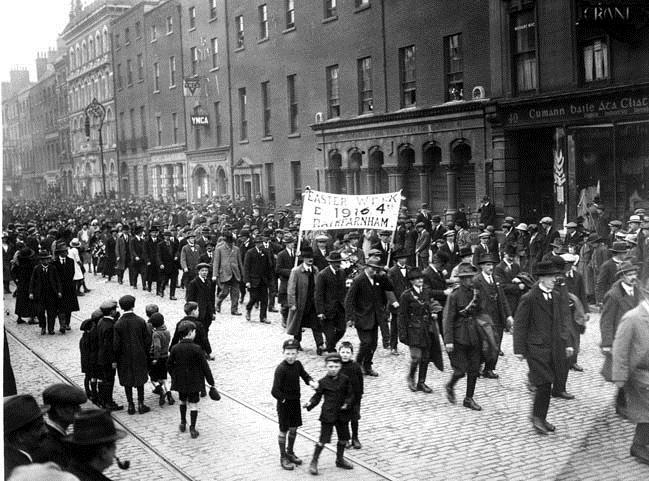 In April 1925, by which time the last Civil War prisoners had finally been released, the Republicans mounted demonstrations all over the country in ceremonies that combined remembrance of the Rising and commemoration of the death of anti-Treaty IRA Chief of Staff Liam Lynch in April 1923. 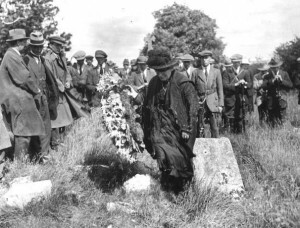 Eamon De Valera addressed about 4,000 followers at the Liam Lynch memorial in the Galtee Mountains and told them that the ‘Republic cannot be achieved by force of arms’. But Lynch, like the dead of Easter Week ‘Had not died in vain’. ‘We will not be slaves’. In Dublin there was again a Republican procession to Glasnevin to mark 9th anniversary of 1916. The Irish Times reported that ‘Forces of military and police were on duty to preserve order.’ No volleys were fired over the graves of the Republican dead. There was also a procession in Nenagh of over 2,000 people ‘for all the North Tipperary Volunteers who had died since 1916’. In Dundalk meanwhile, a march was told by Frank Aiken that they ‘would never recognise a six county nor a 26 county state’. The following year, the tenth anniversary of 1916, was similar story. The official Free State commemorations were confined to the Catholic Mass and military ceremony at Arbour Hill, whereas the Republican opposition, coordinated by the ‘Easter Week Commemoration Committee’ held marches across the country. Though many pro-Treatyites were also veterans of the Rising it was the anti-Treaty Republicans who made the Easter commemorations their own. At this point therefore, the Easter Rising commemorations acquired a somewhat subversive character. Yes, the Irish state traced its lineage back to the Proclamation of the Republic in 1916, but it was vulnerable from the start to the charge that it had betrayed the memory of the Easter rebels with its faint hearted compromises (or at least so they could be portrayed) on the unity and independence of Ireland. Afte Eamon de Valera’s Fianna Fail came to power in 1932 they tried to integrate the republican commemorations into the official state ones. A rival IRA rally at Glasnevin, appealed for recruits into IRA, and Sean Russell told his listeners, a crowd of ‘several thousand people’ that, ‘Constitutionalism has failed in Ireland, so has coercion’, condemning the government’s ‘coercion act’. He condemned ‘national insults’ asking IRA to hand in its weapons and de Valera’s creating of the Volunteer Reserve, an ‘adjunct of Free State army’ to replace the IRA. The IRA was banned by Fianna Fail shortly afterwards, having been legalised in 1932. The Blueshirts, the pro-Treatyite militant group, another possible rival claimant of the 1916 legacy had been banned earlier that year. By the mid 1930s, rival Republican groups still claimed to be the sole inheritors of 1916. By 1936, the 20th anniversary of the Rising, the Easter Commemorations had become well established as perhaps the most important event in the Republican commemorative calendar. But by this time they were already a highly contentious and contested series of events. Remembering the Rising of 1916 could be a means of bolstering the southern Irish state, but also ,even after Fianna Fail’s electoral victories, of undermining it too. There were already those who would never recognise the ‘partitionist’’ Free State and who considered its appropriation of 1916 as a sham. In Northern Ireland, too where commemorating the Rising was illegal, the Easter Commemorations had by 1936, become a means of consolidating and encouraging an anti-state Republican message. The Proclamation of 1916 had declared, ‘The Irish Republic is entitled and hereby claims the allegiance of every Irishman and Irish woman.’ Even twenty years later, the legacy of this sentiment was still bitterly divisive, in Ireland north and south. 11 Responses to "Commemorating the Easter Rising Part I, 1917-1936"
Oh wow. Thanks for the link. I’ve a longer post on the early Easter Rising commemorations in Belfast. There are some others on the 1950s too as the commemorations provide a barometer of competing the expressions of republicanism in Belfast at the time. I think a notable model for depictions and commemorations of ‘martyrdom’ after 1916 were the Manchester Martyrs. Also (oddly), Commandant-General Sean McLoughlin, and Brigade Commandants Robert Brennan and Liam Mellowes (at least) all outranked De Valera by the end of the Rising, which seems to be overlooked. Two of my da’s aunties were in the Broadway Cinema the time the Proclamation was read out in 1943. The version he got was the place erupted in hysterical cheering when McAteer finished. Got a press photo in my hands dated 4th May 1932 shows eight RIC and one “crippled man” at the Milltown Cemetery Belfast…. Thanks Lisa. Will read with interest. Read your piece Lisa, I note it was a commemoration of the executions not the Rising though!